Meet the face of Cousins Tours and Travel, Gina Harris. If she's not working on the weekend, she's competing in a triathlon, open water swim or planning her next Tour de France cycling expedition. Gina is passionate about life, people, travel, art and sports. As her client's will attest, her passion and energy are infectious. When asked of her three top travel highlights, her response was "Greece, Italy, Africa, Mauritius, Bali, Singapore, Maldives, Turkey, Spain, Hawaii, Noumea,Vanuatu, Thailand, Hong Kong, Mexico." Gina's experience in the travel industry spans nearly 30 years. 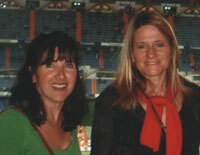 She has worked in or operated agencies in Greece, London and Melbourne specialising in corporate and leisure travel. Gina is a seasoned sportswoman and competes in many interstate and international triathlon, swim and running events. Recent highlights: World Triathlon Championships in Montreal and Cancun, Noumea International Triathlon, Byron Bay Triathlon and other local events. Gina is the founding publisher of the Cousins Tours and Travel Open Water Swim Calendar, which provides details of open water swimming events in Victoria. Demand for the calendar has grown significantly over 10 years and attracts tens of thousands of website visitors each year. Gina contributes regular travel features to leading sporting magazines, Triathlon and Multi Sport. She is also on a number of organising committees for various charitable causes.